GOLDEN, Colo. — Forty years ago, President Carter established a government agency here in a small suite of rental offices with an adjoining laboratory. The Solar Energy Research Institute (SERI) had an ambitious mission, but few paid serious attention to Carter's idea that U.S. energy policy should look beyond coal or oil. "It was considered to be like a hippie thing," one veteran scientist recalled. "It wasn't taken seriously." Not anymore. According to the Department of Energy, the solar industry employs 374,000 Americans, with 260,000 of them working more than 50 percent of their time in the business. Its hiring rate is rising 17 times faster than the nation's economic growth. In some parts of the world, particularly in China, solar's growth rate is even higher. Generating new science and providing a rich initial market through its space program, U.S. research led the world for three decades with photovoltaic (PV) cells, primarily made from silicon. Then China hit the accelerator. It found new ways to make them faster and cheaper (Climatewire, March 22). "One can argue that PV is growing at such a rate that it's on its way to becoming mankind's largest enterprise," said Greg Wilson, co-director of the PV program at the National Renewable Energy Laboratory. The once-tiny suite of offices at Carter's solar institute is now a sprawling campus of buildings, renamed NREL. Its research has launched a second wave of new technology called "concentrating solar power," or CSP. It's spreading around the world after a difficult and expensive U.S. development effort that got a nudge from the space program. CSP, which uses a series of movable reflectors to catch and then concentrate the sun's heat to boil water or to heat other fluids such as molten salt, has been around for 30 years. But now its higher efficiency has begun to appeal to utilities. According to NREL, there are now 40 to 60 commercial-sized CSP plants operating around the world. "China is positioning itself to be the world's leader in CSP," noted Mark Mehos, NREL's program manager for CSP, "but it's a good question to ask who is the world leader right now." Demand for CSP plants is growing rapidly. Attracted by its ability to store renewable energy, utilities in several countries are soliciting bids for CSP plants, and others are preparing them. It will take four years or more to see the results. Unlike with solar cells, which took off first in the United States, most commercial CSP demand is happening abroad. While CSP plants can convert energy delivered by solar to a conventional generator at a stunning 42 percent rate of efficiency, in the United States, natural gas prices are among the cheapest in the world. That keeps gas-fired power plants competitive. Because most countries either don't have cheap natural gas or prefer to export it, Mehos explained, "the market outside the U.S. is where this [CSP] could happen sooner." The leading U.S. company in the CSP business, privately held SolarReserve in Santa Monica, Calif., has recently won two big contracts to build CSP plants, one in southern Australia and another in South Africa. It is competing for other projects in Chile, the United Arab Emirates and Morocco. In most cases, Mehos noted, the competition is head-to-head: solar pitted against natural gas and nuclear plants with no subsidies for renewable energy. Kevin Smith, SolarReserve's CEO, says the clincher in these deals is often storage. Remarking about the press interest in whether solar power might survive the recent solar eclipse, Smith noted that the event "was not a big deal for us. With 10 hours of storage, we can take a nine-hour eclipse." The question of how to store solar energy has puzzled engineers since the 1970s, but two decades later, one answer stumbled out of the U.S. space program. Rocketdyne, a company making the engine for the U.S. space shuttle, discovered that a way to prevent the tails of rockets from melting under the intense heat of the launch was to circulate liquid metals or molten salts through thin pipes in the rocket's outer skin to carry away the damaging heat. Then the company began to realize there might be earthbound applications. Some experts wondered whether nuclear power plants might be more efficient using much hotter molten salt as a coolant instead of water. Rocketdyne began experimenting in California deserts to see if molten salt presented a way to capture more intense heat from the sun. Smith's company began working with Rocketdyne, developing a system where large ground-based mirrors called heliostats, driven by computers, reflected solar beams and aimed them at a "receiver," a tall tower with a tank of molten salt running through tubes at the top. "The Rocketdyne guys used to say that our receiver was like a rocket engine turned inside out," Smith recalled. SolarReserve, formed in 2008, bought the rights to the technology and began working to scale it up into what became Crescent Dunes in 2015. 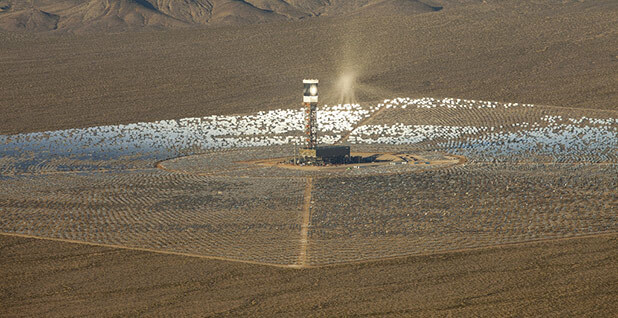 It was a circular array of 10,000 heliostats, built near Tonopah, Nev. The tracking mirrors pointed the desert sun at a 640-foot-tall tower that held the receiver. There, molten salt was heated from 554 degrees Fahrenheit to over 1,000 F. Then, the super-hot salt was pumped down into a hot salt tank, where it was stored. Some of it was drawn off into a heat exchanger where the heat flashed water into steam. It turned a turbine to make electricity. The economic beauty of the plant, according to Smith, is that the hot salt tank can store enough heat to keep the process going for as long as 10 hours, which meant that yesterday's sunshine can keep the signs of the casinos along the Strip in nearby Las Vegas flashing through the night. To be sure, Crescent Dunes, which cost around $1 billion, was still a gamble. The plant had to shut down for eight months last year when one of its salt tanks sprung a leak. Smith called it "a construction defect." SolarReserve had to transfer the molten salt to another tank and then cool down the leaky tank, which had cracks in its floor. "It was the first time anybody in the world had to deal with that," explained Smith, who said the damage was covered under a warranty made by the project's contractor. Researchers are working on similar problems. This month, NREL scientists said new research using nickel-based coatings on stainless steel surfaces, such as in tanks, "looked promising" to limit salt corrosion in CSP plants. It could help the facilities last 30 years. SolarReserve's competitors, however, faced bigger challenges. Worldwide, according to Mehos of NREL, there are more than 50 operating CSP plants. Most of them are so-called parabolic troughs. They concentrate solar heat and use it to boil water to make steam. Recently, more companies are taking the more ambitious "power tower" approach. Some companies in the United States approached bankruptcy. Others, such as BrightSource Energy Inc., an Israeli-American company, began pulling out of U.S. projects to focus on overseas CSP contracts, the largest of which have been proposed by China. Ten to 20 CSP plants could be built in China over the next two years. One project, the Huanghe Qinghai Delingha Solar Thermal Power Generation Project in northwest China, will use BrightSource's concentrating solar technology as part of a plan employing multiple towers. It's part of a number of U.S.-China clean energy initiatives implemented by the Obama administration. One result, according to Mehos, is the emergence of hybrid ventures that include Chinese companies bidding on proposed CSP plants in the Middle East. BrightSource is involved with one. SolarReserve, according to Smith, is in the early stages of a partnership to build a CSP plant in China. Mehos predicts the economics pushing CSP projects abroad will change when U.S. utilities, becoming addicted to relying on cheap, clean power from photovoltaic solar energy, find they have too much of it during the day and not nearly enough when the sun sets in the evening. "California is a good case in point," Mehos explained. By 2025, he predicts, its utilities will want a clean, storable capacity of CSP that will carry them into the night. When that happens, he thinks, companies like SolarReserve and BrightSource "will be ready to come back here" and bid on projects that can store solar energy. Storage batteries may not be cheap enough or have enough duration to compete with substantial use of molten salt, he says. Crescent Dunes, built with a $737 million loan guaranteed by DOE on 1,600 acres of land leased by the Bureau of Land Management, "was the first plant of that scale and type built in the world," Mehos said. As the market matures, it will be among the projects that is "financeable" in the United States, he predicted. As part of its SunShot Initiative, DOE is researching ways to make CSP more competitive by using turbine working fluids such as supercritical carbon dioxide, a material that under extreme heat and pressure gains the properties of both a gas and a liquid. As it stands, CSP will not work everywhere in the United States, nor in the world, Mehos cautioned. It requires regions with relatively few clouds and a desertlike dryness to generate sufficient electricity to minimize generation costs. "The southwestern U.S. is one of the best," he said, but the Middle East, North and South Africa, Spain, Chile, much of Australia, and "a good chunk of China" could also benefit from it. SolarReserve has already developed a project for its U.S. comeback. It would be called Sandstone, the world's largest CSP power plant. It would feature 10 towers, cost $5 billion and produce roughly the same amount of electricity as Hoover Dam. It would be built in the Nevada desert but send much of its power to California, which plans to meet a target of 50 percent of renewable energy by 2030. While it has begun to file permits to lease federal land for Sandstone, Smith, SolarReserve's CEO, was cautious about predicting when construction might start. It faces many hurdles, including raising the money to build it and revamping transmission lines to dispatch most of its electricity westward to the state with the most ambitious clean energy plans. But Smith said Sandstone will bring the technology that California needs most. "They're only going to do that with storage." Correction: Due to a typographical error by the Department of Energy, an earlier version of the story underestimated the number of Americans working in the solar industry.